The 21st century will be defined by security threats unconstrained by borders—from climate change, nuclear proliferation, and terrorism to conflict, poverty, disease, and economic instability. In this era, building partnerships beyond national borders and governments is critically important and strengthening ties among people of different nationalities, cultures and religions is crucial. In this context we value, among others, the programs that connect people to people of the world and bring them closer together. 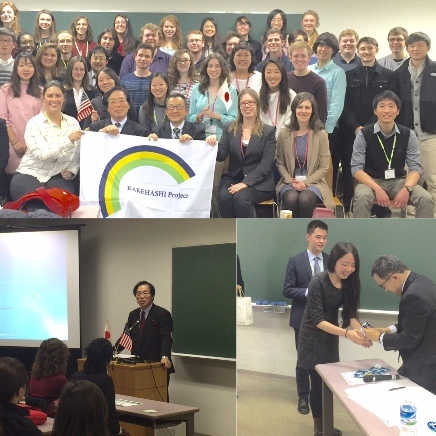 KAKEHASHI, targeting young people in North America: the United States and Canada, is one of such programs we are commissioned by the Government of Japan. It is part of the Japan Friendship Ties Program launched by the Ministry of Foreign Affairs of Japan with an aim to promote deeper understanding between Japan and the two countries through exchanging visits of students and young professionals. KAKEHASHI is a Japanese word meaning a bridge. A bridge connects people on both sides of the water. Under KAKEHASHI Project, more than 1200 American students, researchers and young professionals are invited to Japan to attend an eight-day program consisting of exchange visits, cultural observation, school visits and home stay. In exchange, more than 300 Japanese college and high school students visit the United States to engage in cultural exchange activities and home stay. One of the unique features of the invitation programs offered by JICE is the reporting session which is held on the final day of the program. 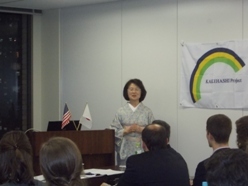 Each group of the participants from the United States and Canada is required to make a presentation on their findings and impression of Japan as well as the action plans for disseminating them to their friends and colleagues back home through social networking media, publications, events, etc. This session is important for JICE and the Ministry of Foreign Affairs to monitor how they are going to present Japan after returning home. JICE is making efforts to make this session as interactive as possible by inviting Japanese intellectuals and experts on Japan- US relations and other related issues to react to their presentation. On January 13, we invited Mr. Yuji Suzuki, Board Member of JICE and former professor at Johns Hopkins University (JHU) to speak at the reporting session by 48 university students including JHU. 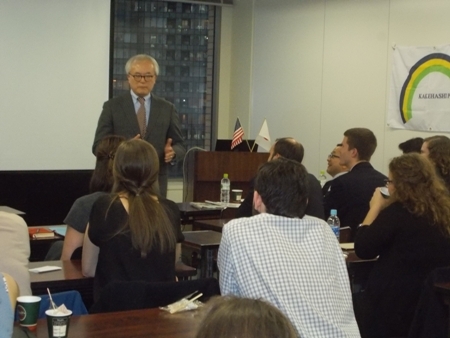 Professor Suzuki emphasized the importance of Japan- US relations recalling the days he was teaching at JHU. 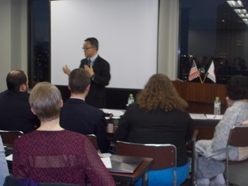 On February 22, we invited Prof. Tomohiko Taniguchi of Keio University, also serving as Special Advisor to the Prime Minister’s Cabinet, to join the session by 20 young researchers from Brookings Institution and Center for American Progress. Prof. Taniguchi passionately talked about how Japanese in 1960’s were well connected to American celebrities such as John F. Kennedy and Edwin Reischauer. In this way, we are keen to enrich KAKEHASHI Project so that it will further enhance people-to-people relationship between Japan and North America.